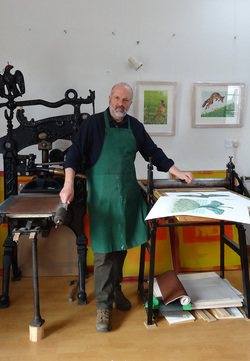 Born in North Lincolnshire in 1952 and attended Wolverhampton, Farnham and Walthamstow Schools of Art; finally completing a Post Graduate Certificate in Printmaking. Work from that period in a number of private and public collections (including Manchester City Art Gallery and the RCA). Worked as a ‘master’ printer, editioning original screen prints for many well-known artists whilst teaching printmaking and design in London; then as a designer, commercial screen printer and gamekeeper. Then back to full time teaching, becoming head of printmaking at Colchester School of Art. A career shift to work in education in countryside and wildlife management: becoming Head of Land and Animal Management for the University of Cumbria, whilst continuing to illustrate, design and experiment with the rapidly changing technologies in print and digital media. Eight years ago shifted career back to being an artist again. Set up full time print workshop and studio to produce original limited edition screenprints and linocuts and now developing the intaglio and relief printmaking facilities at Craigshaw Barns Studio. Selected and hung in the last two Royal Glasgow Institute Open exhibitions. Work selected and hung twice in the Royal Scottish Academy Open and winner of the RSA Roy Wood Prize for Printmaking. Major contributor to both editions of 'The Artful Hare' published by Mascot Media. Selected for ‘Spring Fling’ Open Studios for the sixth time. I continue to be fascinated by the possibilities and qualities of original prints. I am interested in images that are not in any way reproductions or imitations of any other medium, but that create the interest of effects that only hand crafted prints can offer; along with the advantages of producing multiples in (truly limited) editions. In my own prints I want to explore the possibilities of making images that are, in one way, those of traditional ‘countryside’ and/or wildlife subject matter; but that take a less traditional approach. I continue to explore the use of contemporary technology and modern materials and techniques in conjunction with high levels of traditional craft skills and process. Here is an article about me in Shooting Times and Country Magazine from July 2014 . Click to enlarge.